Tickets cost $18 in advance, $22 day of show (plus applicable service charges). With exceptional musical quality and a visual kaleidoscope of performers, MarchFourth is a spectacle of high-energy compositions, colorful costumes, and irresistible charisma! M4 has been seen on stages from ESPN's Espy Awards to festivals like Wakarusa, Bumbershoot, and High Sierra Music Fest, to world-class venues like The Kennedy Center and The Fillmore, and even a cultural exchange tour to China, sponsored by the US State Department. 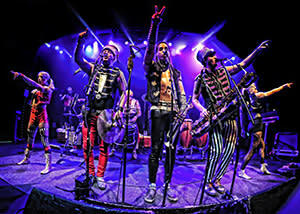 "Perfectly merging the artistic spirit of Portland with the musical spectacle of New Orleans, MarchFourth put on one of the most complete shows of any band on any stage. 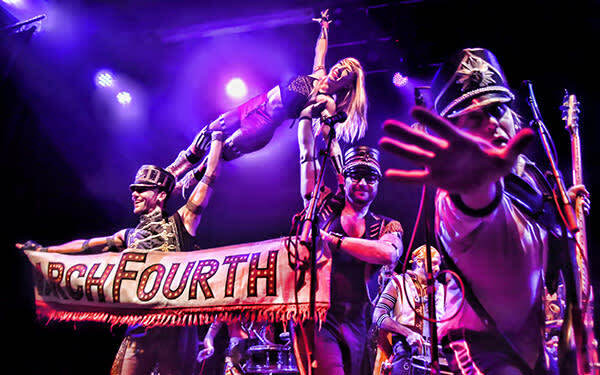 From rocking big band jam tunes, choreography and feats of strength that need to be seen to be believed, MarchFourth entertains on every level every second they are on the stage... or off!" A tiny mountain orchestra in a wooden box with rusty hinges. Listening to Cloacas is like traveling sideways in time. This ensemble invokes elements of folk, Americana, classical, jazz and American gothic styles as well as whatever their acoustic instruments inspire. They present a humorous but sincere irony that is sometimes bittersweet and melancholic, and sometimes gangly-legged and goofy. Their music will make you stomp, toe-tap, do-si-do, go off trainhopping and build a campfire!